In this Mongoose Ruddy Comp Review you’ll get the facts. When I was a kid, I used to ride my bike all the time, from sun up to sundown. In high school, I got into mountain biking. During college, the only time I would ride my bike is if some old friends came to town. Otherwise, it hung up in my garage collecting dust. Earlier this year, on my 30th birthday, I realized I really missed biking. My job is stressful, my life is boring, I was feeling more and more out of shape, and I needed to remedy that quickly. A few weeks later I took my bike out of storage and started riding the local trails. After a few long rides, I decided I needed (and deserved) an upgrade. I was looking for something high-quality but under $1,000. 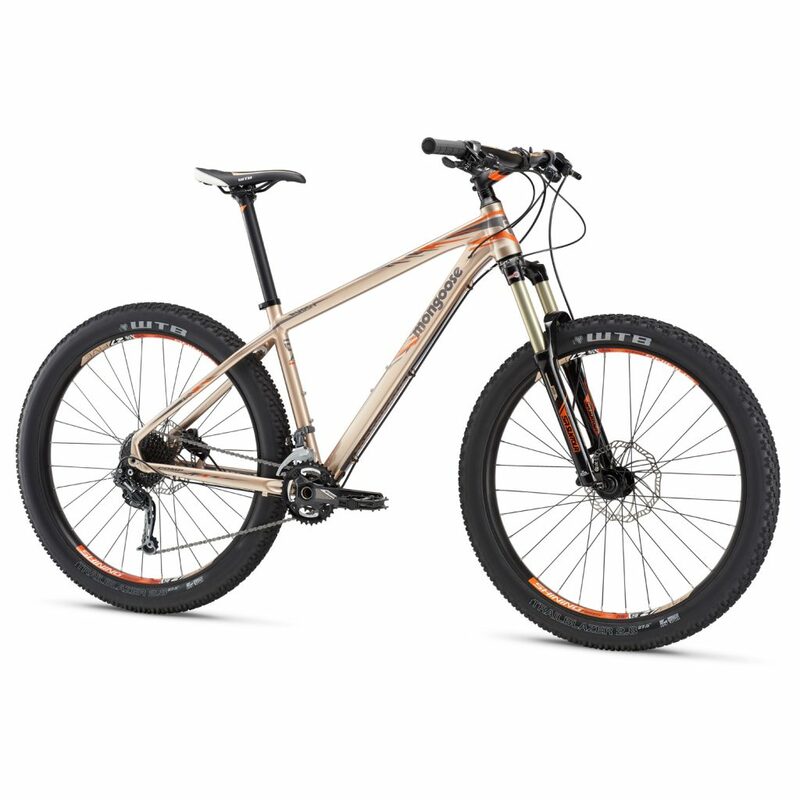 I shopped around and purchased the Mongoose Ruddy Comp 27.5+ Mountain Bike after trying out a few other bikes. If you’re looking for a mountain bike that won’t break the bank and can handle a rocky ride, my Mongoose Ruddy Comp review should help you make a well-informed decision. If you’re in a hurry and just want to see the best price for the Ruddy Comp, we got you covered! Click here to see the best price for the Mongoose Ruddy Comp. 1.2 What Is The Mongoose Ruddy Comp? If you’ve already started browsing the market for mountain bikes, you may be overwhelmed by your results and some of the prices might be way out of your budget. 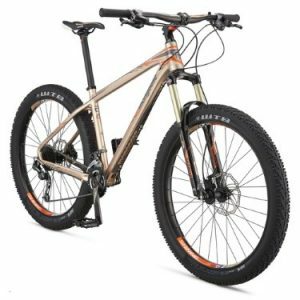 Before you decide that there are no worthy mountain bikes on the market within your budget, there are many bikes for many budgets. Don’t let your budget get in the way of a fun weekend of mountain biking. Whether you’ve been biking for years or have been thinking about starting, mountain biking is a great way to clear your mind, get exercise, and enjoy and explore the great outdoors. If you’re more about the experience than the money you spend, a budget-minded bike is for you. Anyone who isn’t afraid to get a little dirty, sweaty, or even risk the chance of having a small “wipeout” is an ideal candidate for a mountain bike. Anyone who likes a bit of a challenge and is ready for a different bicycling experience should consider a mountain bike. Maybe you don’t like to ride a bike or mountain biking might not be your idea of fun (but maybe it’s what you’ve been missing). Don’t buy a mountain bike if you like things to be kept clean or if you hate spending time outdoors. If you think that less expensive mountain bikes are inferior to high-priced bikes, you won’t appreciate all the features of a budget-minded mountain bike. If nothing about mountain biking appeals to you, there are plenty of other activities that you could try instead. What Is The Mongoose Ruddy Comp? While there are thousands of budget-minded mountain bikes on the market, there’s something to be said about a company, like Mongoose. The company continues to manufacture affordable and high-quality bikes for every type of rider from a beginner to an expert. While the ride is smooth, the Ruddy Comp is quicker than your standard fat bike since the tires and wheels are not the same widths or weight of a fat bike tire. The Ruddy Comp light, fast, and a comfortable mountain bike for various types of terrain. 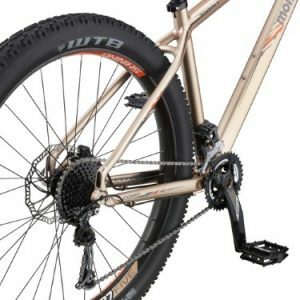 Compared to a similar mountain bike, the Diamondback Overdrive Comp 29er, the Ruddy Comp has smaller tires (the Diamondback has 29×2.25 tires) and the suspension is better (Diamondback has 100mm). While the Diamondback is a comparable ride, it operates a little more rigid or stiff and lacks some of the “smooth riding” capabilities of the Ruddy Comp. The Diamondback may not be as comfortable in different types of terrain. Whether you’re buying a mountain bike for the first time or you’re an experienced rider, the specs are essential before purchasing a bike (regardless of the cost). The Mongoose Ruddy Comp is a versatile mountain bike for a rider of any expertise and rides well on flat trails and rocky, steep terrain. Whether you need to run a few errands before you hit the trail or want to take a spontaneous trip, this mountain bike may be all the bike you need and want. One thing I noticed, when riding my old mountain bike for the first time in about ten years, was the bad suspension. Maybe it’s because I got older or the suspension was never that good before, but I “felt” the roughness of the trail the next morning. The suspension on a mountain bike is important because it suspends the rider (and bike) to protect them from the uneven, rough terrain. Think of your bike’s suspension like your car; it’s important to have. The Ruddy Comp has an SR Suntour Radion 27.5+ suspension fork with 120 mm of travel to make the ride over most terrain more smooth. The suspension fork also uses a remote lock-out so you can decide when to use the suspension, depending on the terrain. If you haven’t ridden a mountain bike in a while or haven’t taken a close look at all of the bikes on the market, you may think that mountain bike tires are the same from one bike to the next. The WTB TrailBlazer tires (27.5” x 2.8”) on the Ruddy Comp are suitable for flatter trails but also perform well on steep inclines and rocky terrain. They feature an all-around tread, are tubeless ready, are large volume (similar to the fat bike tire). 2 gears up front, 10 in the back. If you are new to mountain biking, you may be confused by the gears. Learning to shift may be tricky enough, but how many gears do you really need? While the number of gears is more of a personal preference (many riders like 27 gears), but if you’re starting out or just want to keep the ride simple, fewer gears may be better. The Ruddy Comp is a 2 x 10 bike. This means that there are 2 gears in the front and 10 in the back. 2 x 10 bikes can be great for all kinds of terrain, and the rider can spend more time having fun than worrying about the complexity of shifting gears. When I took my old mountain bike out for a ride, I noticed how heavy it was and how it didn’t really seem to gain any speed. While the ride was fun, I knew I wanted a lighter frame. If you have a mountain bike and it’s a decade or more old, it’s probably pretty heavy. Most mountain bikes (even the budget-friendly ones) have aluminum frames. This type of frame makes the bike easier to carry (if you need to) and take on and off your bike rack. It’s also easier to gain speed and do a few jumps if you want to, too. Aluminum is durable and strong, so you can ride hard and not worry about damaging the bike. Mountain bikes have been popular for decades, and there are so many that are nearly identical, which means that there are a lot of great options on the market. What makes The Ruddy Comp so unique? As I already mentioned briefly, some mountain bikes are more advanced and are only suited for riders with experience. The Ruddy is versatile and easy enough to ride that even a beginner to mountain biking might be comfortable and confident. While The Ruddy is a good “starter” bike, that doesn’t mean that an experienced rider will tire easily from riding this bike or get bored. Every mountain bike rider needs to start somewhere, and this bike is a good option. 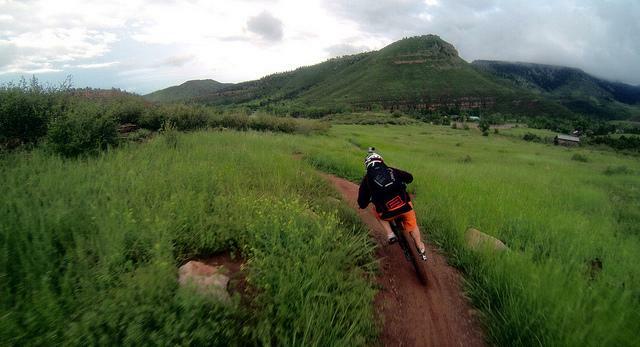 Some mountain bikes are best suited on a mountain top, others on a trail. The Ruddy can handle all types of terrain which makes it a bike that you might be likely to ride whenever and wherever. Why have more than one bike when this one has everything you need? The Mongoose Ruddy Comp is priced at $899.99. Finding a high-quality mountain bike, like the Ruddy Comp, for under $1,000 is a good deal because you can invest in some good gear like a helmet and shoes. If you have a prefer a different saddle (the Ruddy Comp is a little narrow) or have specific preferences in regards to bike pedals, the savings on the Ruddy Comp may justify other purchases you make. After years of not riding, I wanted to make sure I was buying a good bike within my budget. 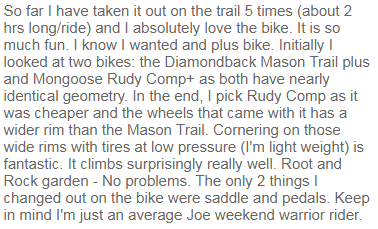 This meant I did a lot of test riding and I also read a lot of reviews and ratings from fellow mountain bikers. When in doubt, ask other bike riders what they think about a bike. One of the main reasons I purchased The Ruddy was due to the positive feedback. With so many mountain bikes on the market, it’s natural to want to look around and explore your options. Diamondback Recoil 29er: The first thing that attracted me to this bike was the price, as it was in my budget and less expensive than The Ruddy. 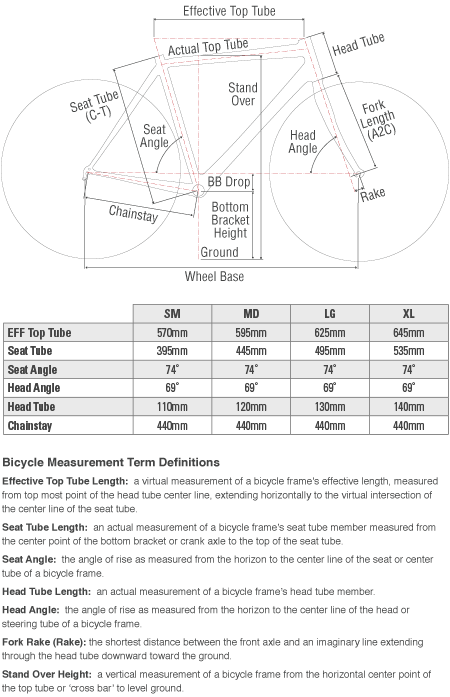 The tires are a little larger (29 x 2.2”) than The Ruddy, and there are 24 gears rather than 20. It has an aluminum frame and was lightweight and fun to ride. With 100mm of suspension, I was left wanting a little more, but it handled well on all types of terrain. Click or tap here to learn more about the Diamondback Recoil 29er. Diamondback Apex Elite: Another budget-friendly bike that caught my eye. I was hoping that The Apex Elite had 27.5” tires for a large frame, but that tire size was only available in XS to SM frames. It has 27 speeds, a lightweight aluminum frame, and suspension of 100mm. This might be a great option for someone who wants a lot of gears. Diamondback Atroz: The Atroz was a close second to The Ruddy. With a nearly identical makeup (tire size, suspension, aluminum frame), it was a difficult decision. In the end, I decided I wanted a few more gears to play around with as the Atroz offers 1×9-speed drivetrain. Click or tap here to learn more about the Diamondback Atroz. The Mongoose Ruddy Comp is the first mountain bike that I’ve owned that gives me everything I need and want in a bike, plus the price is right. If after reading my Mongoose Ruddy Comp review, you want to know if it’s the bike for you, cehck it out for yourself. I think you’ll be as impressed as I am. While it’s true that you can spend up to $10,000 on a mountain bike (and these are probably some fun rides), you can also spend $1,000 or less on one that is offers everything you want in a mountain bike.